According to the American Dental Association, an estimated 5 million teeth are knocked out every year through sports. The ADA also believes that wearing a mouth guard prevents 200,000 injuries to mouths of athletes and sports players every year. In addition, the Academy for Sports Dentistry recommends mouth guards for more than 40 different sports. You buckle your seatbelt when you ride in a car. When you ride a motorcycle, you wear a helmet. You wear eye protection when operating certain tools. Why wouldn’t you wear a mouth guard when playing a sport? 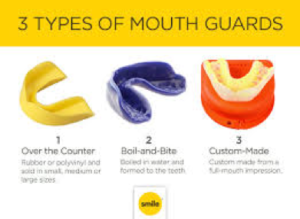 Going out on the playing field wearing your mouth guard is as important as putting a baby in a car seat. And, popping a mouthguard in is also much easier! Those who lose teeth from rough play probably wish they had put their mouth guards in first. If you or you kids are involved with sports, it’s only one small thing you need to do to protect your teeth for a lifetime. Wear your mouthguard. Make an appointment with your dentist so you can pick the best solution for your mouth.